Woven Shibori: how do I get those patterns? I’ve been busy with a few new scarves. These are lighter weight using a very fine 30/2 cotton or 60 threads per inch. I start out with all white yarn…as always. 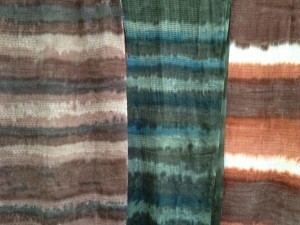 These scarves are woven with a pattern thread of sturdy nylon. 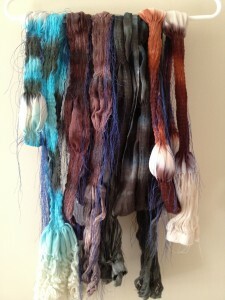 After the scarf is removed from the loom, I paint it with dye (Mx fiber reactive dyes). Look very closely and you will see blue pattern threads. Next step, pull all the threads, very tightly and tie knots. This slippery thread is like trying to put a knot in fishing line. I’m very proficient at this when at the beach – it takes more care when preparing these scarves for the next round of dyeing. As you can see in the photo, the same three scarves are now a skinny bundled mess. Crazy as this seems, with all the great colors in the first photo, I’m going to dye them again. This dye process is called VAT dyeing. These dyes are powerful…they can remove the first color I applied, they remove certain molecule colors. They CHANGE! With plenty of experimentation, I will get a clue – not a guarantee – of what the new color might be. << This picture on the left shows how the color has been removed on two scarves and applied in a deep black and red on the outside scarves. 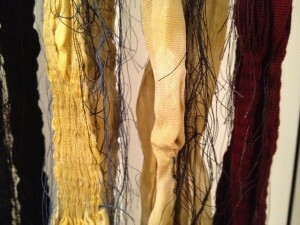 The next entry will show the results after all the knotted threads are removed. Stay tuned.